Only a few and the proud can be admitted into a United States Service Academy, and rightly so. It’s tough to get in and tough to make it through, but since the job after graduation requires people of great courage and determination, then the application process is a fitting place for you to start showing your mettle. So, you think you want to be an officer in the Military? To do that, you can go to one of the 5 Federal US Service Academies, you can go to a military college or university, or you can go to a university that offers an ROTC Program. Begin to research these programs as soon as possible, because there are many things you need to do to become an Officer. The Federal Service Academies include United States Military Academy (often referred to as West Point), United States Naval Academy, United States Merchant Marine Academy, United States Air Force Academy, and the United States Coast Guard Academy. 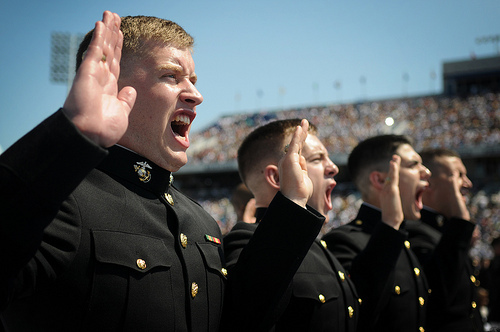 The five Service Academies offer a free, top-notch college education to these men and women who dedicate their careers to serving our country, many of whom choose to major in some field of Engineering (yay Engineering!). This is a breakdown of what you need to do to get into one of the Academies. 1. Focus on your grades. Just as an example, 90% of Cadets at West Point were in the top 20% of their class. Your GPA is really, really going to matter in this game, so do your very best starting freshman year of high school. 2. Open your (pre) Candidate Profile on each academy’s/school’s website. This starts the process and is not optional, and it should simultaneously register you for the mailing lists so that you can stay informed about events near you. Try to do an official, registered campus visit when at all possible so it goes on record that you were there. Some campuses may allow you to stay overnight and sit in on classes, or even meet someone in admissions. While you are there, be sure to take the tour and be on your absolute best behavior. Every interaction counts in admissions, and doubly so in the military. Each geographic area of the US is assigned to a representative or liaison for each Academy, and you will need to meet and likely interview with this person. Prepare for and ace your interview with the liaison. Read current events before you go and practice what you might say. Be sure to show your desire to be in the military; have a ready, polished answer for why you want to join the Service. You should also attend the Academy events in your area (which are usually held in October and March). You will want to reach out to everyone you know to see if anyone can introduce you to one of these government officials, or even put in a good word for you. Every little bit helps, and be diligent about asking people. Start early. Network with both Senators and Congressmen because they can only offer 10 nominations each. Call their office and ask if they offer any events that you can attend, or if you can intern or volunteer there, or if you can just come and meet them sometime–anything. Always be amazingly polite. In the military, “Yes, Ma’am” and “Yes, Sir” go a long way. In the Spring of your Junior year, you will need to start the formal application process to receive the nomination. Contact the offices of these government officials to ask about the procedure–or better yet, check on the website first and then follow up with any questions via a call or scheduled visit. You do not need a nomination for the Coast Guard Academy. You should also see if you can claim residency in multiple districts (state and county, perhaps) as this would increase your chances of securing the nomination because you could ask multiple officials. You can apply for a nomination from these four sources: 2 Senators, 1 Congressman, or VP of US. Many of these officials make their decisions in the Fall as to whom they will write letters for, but you should start MUCH EARLIER with familiarizing yourself with the process and networking (networking means getting to know people who might someday be able to help you). The nominator will notify the Academy if you are selected, so there is nothing you need to do there. (Note: Each member of Congress can have only 5 people attending the Naval Academy at any time. 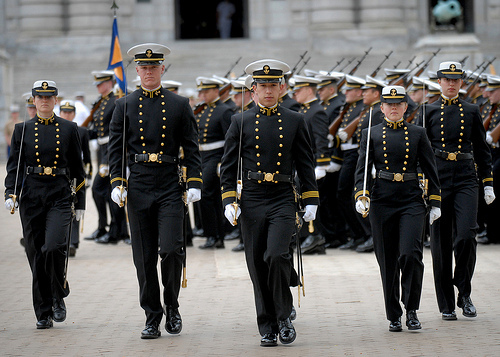 Members can nominate 10 candidates for each vacancy so the Naval Academy can choose–OR they can nominate one principle nominee and 9 others as alternates). These seminars, where offered, are solid introductions into what your life would be like at a Service Academy. The camps, like the Academies, are intense. Many Academies like one rec to be from your guidance counselor. Some Academies want a rec from your English, Math, Physics or Chemistry teacher. Check requirements and do your absolute best for all of your teachers. A Senator or Congressman will typically request that you submit: an application, 3 rec letters, official transcript, SAT/ACT scores, resume, 250-500 word essay (usually on why you want to be in the military or what it means to you to serve), optional photo. They often request that you mail these in one envelope. You will need to pass a medical examination to demonstrate that you can physically handle the regimen of an Academy. The physician will often ask for previous medical records. You can do this in the Summer after Junior year. If you don’t get in, RE-APPLY. Go to a civilian university and join ROTC, go to a military school, or go to a Post Graduate year to improve your GPA. DO NOT GIVE UP. Military personnel exhibit determination at all times. This is the first of many tests. Do NOT give up. Use the CollegeMapper Military Timeline to stay on track with all your tasks. Volunteer: Start volunteering in your community or school as soon as possible and regularly. Be a leader: Join clubs and activities through your school or community to show your leadership skills, likely when you are an upperclassman. Be athletic: Earning a Varsity letter looks good for your commitment, and being in shape will help you pass the Fitness Assessment. Be prepared: Always know your high school rank, GPA and test scores so that you can set goals for yourself to improve. Do something leadership-related in the summertime: Try mentoring, coaching, tutoring, being a camp counselor, working, etc. Consider going to a military summer school prep program: These really help you understand what the military will be like. Whatever grade you are in, there is something you can be doing now to prepare if attending a military school is your objective. You will need to be focused and set clear goals for yourself. Grades need to be a top priority, and you should take advantage of every opportunity to talk to Academy graduates and current members of the military. These schools are prestigious places to be, and if you gain admittance, you have every right to be very, very proud. For more information login to CollegeMapper and take a look at our timeline for applying to military programs.